To enter your own best iOS shots, please visit iphonelife.com/contest for submission details. You'll not only have the chance of having your photo featured online, but also of winning prizes from Olloclip, CanvasPop, and a spot in our next issue of iPhone Life magazine. Don't forget to check out John's articles for tips and tricks related to iPhoneography, and check back next week to see who gets featured in iPhone Life's Top iPhoneography Pics of the Week! Welcome to my iPhoneography workflow for iPhone Life magazine. 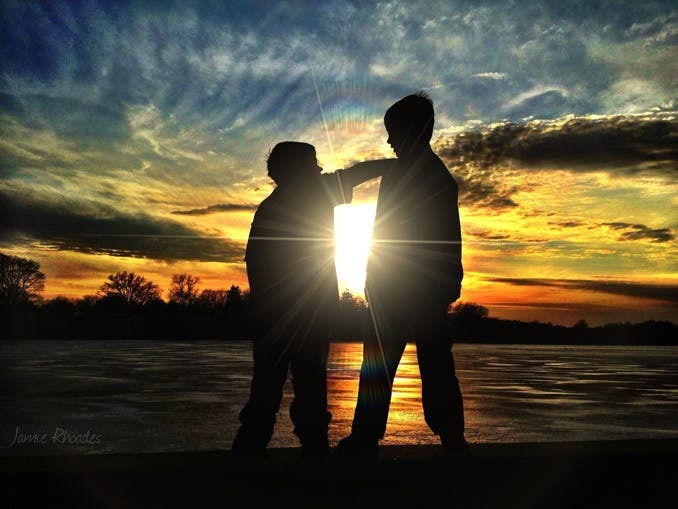 I'm going to walk you through the steps I took to create this photo titled, "Brotherly Love." I should tell you off the bat, I'm a huge fan of Camera+ ($1.99). I take all of my photos with this app and usually run them through an editing process before I move to other editing apps. I would also like to add that I've only been an iPhoneographer for about a year now. I've been very serious ever since. Silhouettes are one of my favorite types of photos, and I often use them while catching a sunset with my kids. The iPhoneography Tip of the Week series features tips, tricks, and tutorials to help you take better pictures with your iPhone. I received a Facebook message from a friend a short time ago challenging me to describe the method she used to create an image of a rose surrounded by a silky-pink tunnel. I found out she used a straw to create the beautiful image, and I decided I would experiment with the trick, and see what I could create. Rangefinders are super hot right now. Photographers looking for a dynamic view while shooting street photography love using rangefinders as their primary platform. The two-dimensional quality, straight-forward shooting is extremely unique. For me, photographing with a rangefinder is far more engaging than using my DSLR. Don't get me wrong, I love shooting with my 5D Mark III, but seeing the focus rectangle glow inside the viewfinder of my Canon QL17 is a truly wonderful experience. With today's digital offerings, you can't go wrong with a Leica or Fuji X100 - the overlays within the viewfinder are brilliant. Taking great shots on your iPhone just got easier with two great freebies recently added to the App Store. Remote Shutter allows you to view/take remote shots through any WiFi or Bluetooth paired set of iOS devices, and Gradients will let you apply your own custom filters to create photographic art! Remote Shutter is a technology-binding application that greatly extends the coolness of owning multiple iOS devices. It allows you to remotely control the shutter/camera of an iOS device through a wireless network. You can see the live camera view, take pictures, and also configure the countdown timer to take a delayed shot of up to 30 seconds. Let's admit it — kids are tough to photograph with your iPhone. That is, unless they're sitting still and posing for you during the "magic hour" of light professional photographers often talk about. Here are some tips to help you make the most of your iPhone pictures. 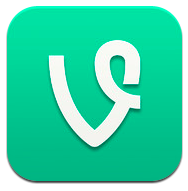 Twitter recently bought Vine, an app used to create videos up to six seconds long. I'm not sure how many videos really are needed of that length. If you like it that's great. The videos also loop and can be used on Twitter, of course. Regardless of camera or the app you use when making videos, here are five basic video making tips that you might find helpful. RØDE iXY Stereo Microphone at CES! Over in the Las Vegas Hotel (right next to North Hall), the CES iLounge Pavilion continues full of great accessory gear for the intrepid wanderer! I'll be posting up a full review on the iXY from RØDE after the show, but the high points include: stereo dynamic mic input wrapped in a superb hardware package, and with a recording/sampling ability and impressive range of editing and sharing options. Serious journalism types, podcasters, and musicians that want to capture high-quality audio with nothing more than iPhone (and the iXY) should give this product a serious look! Read more about RØDE iXY Stereo Microphone at CES! Cinema Trix is a fun app which allows you to add filters and other effects to your device’s camera while you’re shooting video or still images. Unlike many other apps, you can use this one to look through your camera at the world as you want it to be. The augmented reality features allows you to feel like you’re in the matrix or some other exciting world. 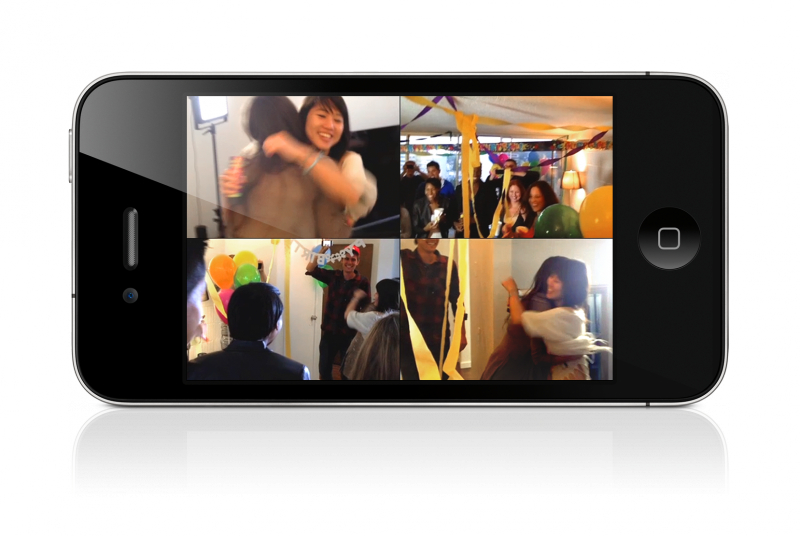 It’s also great for making fun and interesting videos which are altered in a wide range of ways. 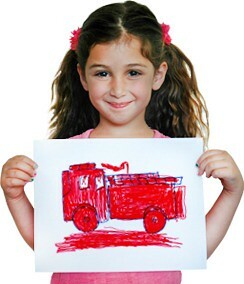 My youngest daughter was nicknamed 'The Factory' at nursery school, due to the sheer volume of artwork she turned out. Sure, we are proud parents, but if I kept everything, I'd be labeled a hoarder. As a parent, I'm guilty of secretly depositing those works of art in the recycle bin. But you simply can't preserve everything your kids create, in school, camp, or at home. I've been a fan of the Olloclip since it came out, so I was glad to see the iPhone 5 version was coming. In fact, I've been able to play with a prerelease version for a few weeks, and you can get one now that it was just announced today. In recent days, you've probably seen and heard a lot about where I live. I live on Staten Island. About 20 fellow Staten Islanders were killed. Many neighborhoods have been destroyed. Some schools are still closed. The restaurant that my family visited on October 19 is gone. Sandy was not nice to us. Volunteers have been coming to help with the clean-up. There's been plenty of criticism about the lack of electricity for thousands. [Fortunately, my power was turned on about after three days.] It's still difficult to get gasoline for the cars. One of the things that always bothered me about using Instagram was sharing images. Now, you can share your Instagram images easily online. If you have an account you can now, or you will be able to do it soon, view your pictures online. 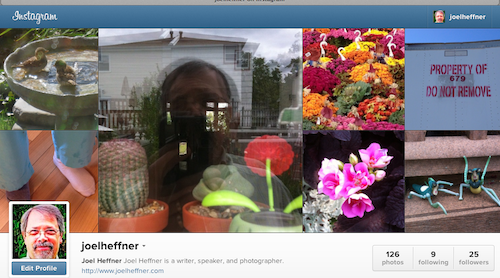 For example, my address is http://instagram.com/joelheffner. [My account became active earlier today.] They say that if you have an Instagram account it should be up and running within about a week. Check with Instagram about your privacy settings. It's a very welcome change...at least to me. I'm not a big fan of Instagram. It can be pretty obvious when a photo has been through an Instagram filter. But what if you really want to manipulate an image, perhaps to make it look like it came from an old film reel? You are going to want more fine grained (pun intended) control compared to Instagram. Use Streamweaver to effortlessly stitch together camera angles! You and your friends are at the game, and a fly ball sails up over your section. You and 2 of your buddies capture hilarious clips of another friend dashing and clawing his way through the crowd to the abandoned level above to retrieve the trophy. After the game, you compare the individual videos thinking how cool it would be to be able to stitch together the different angles side-by-side into one super funny production. Now you can, and it's easy and free, using Streamweaver... Full PR about this excellent startup effort follows. Read more about Use Streamweaver to effortlessly stitch together camera angles! With all the chatter in the blogosphere, about new products soon to be released, and patent battles being fought on all fronts in the courts of law, I think it's important to keep in mind the old expression: "You ain't seen nuthin' yet!" Truly, hasn't this week been a great example of that. With the court cases bringing out details Apple would just as likely have preferred to keep private, we have been granted a rare insight into the evolution of products in the Apple iDevice chain, as well as having been given glimpses into what Apple had in mind, in prototype form, two years ago. 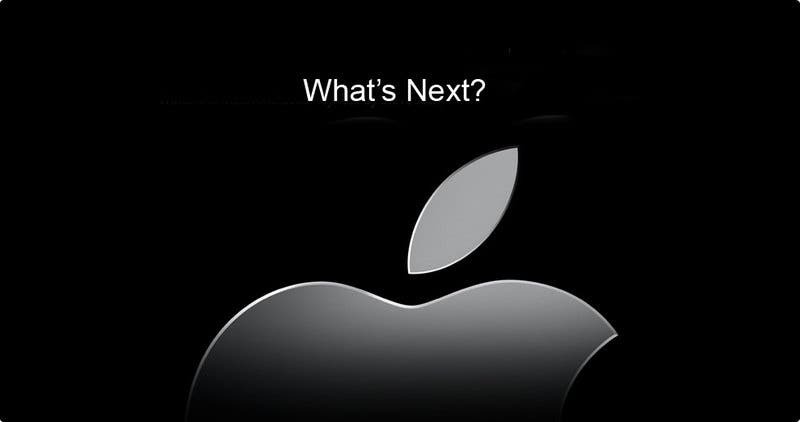 That said, can you imagine what Cupertino has in store for us in say, 5 years? That's not that long. Think about it. Within 5 years, devices and functions that are now, only in prototype/patent form, may very well be seeing the light of day. It's not for nothing that Johny Ive says that the products Apple is working on now, are some of the best, most exciting products Apple has ever invented! In the good old days, I used to edit photos of the kids, turn them into black and white images, and restore some color in a few select areas. I probably could have made a business of it. Now, you can do it on your iPhone or iPad in a few minutes. But change is a good thing, and so is Color Splash Studio from MacPhun. MacPhun has had a popular app for the Mac for a while, so it's nice to see iOS users get some loving. I just received my new MacBook Pro with Retina display, so I thought I would celebrate by editing this photo from last week's WWDC event when I saw Apple's Phil Schiller introduce the new MacBook.